The summer harvesting outside the l.a.Eyeworks warehouse is in full swing! After months of patient nurturing, our plants are beginning to give back in style! 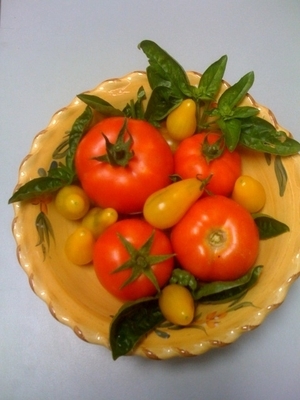 We're delighted to have a mouthwatering melange of tomatoes mint, basil, rosemary, oregano, lemon grass and lavender. Fragrant, fun, flavorful, and (of course) a little funky! 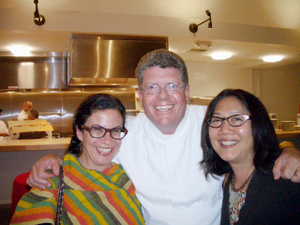 Chef extraordinaire Jimmy Shaw invited us for a sneak peek into his new Loteria! Grill restaurant in Hollywood with a special fete in honor of Diana Kennedy, doyenne of Mexican cuisine. Loteria! Grill is expanding from its legendary casual digs at The Farmers Market to bustling Hollywood Boulevard in June. Jimmy (wearing his vintage Alvar) is pictured with local writer, Ruth Handel (in her nifty Nico), and l.a.Eyeworker, Angela Gee (sporting a Silver Lake). Foodies should note that Diana Kennedy's classic The Art of Mexican Cooking has just been re-issued.